We had decided to do one big special thing in each country - camel safari in India, white water rafting in Nepal, trekking across the Salt Flats in Bolivia. Our big adventure in Borneo was visiting the orangutans in Camp Leaky and that was amazing. But the island of Borneo is split between two countries - Indonesia and Malaysia. We had started out on the Malaysian side and then crossed over in order to visit the Camp Leaky and Derawan Island where we swam with stingless jellyfish and giant sea turtles. But to fly out to Singapore, our next stop, we had to return to Malaysia and I was determined to squeeze in one more adventure. So we decided to spend a few days living with the Dyaks in the jungle. 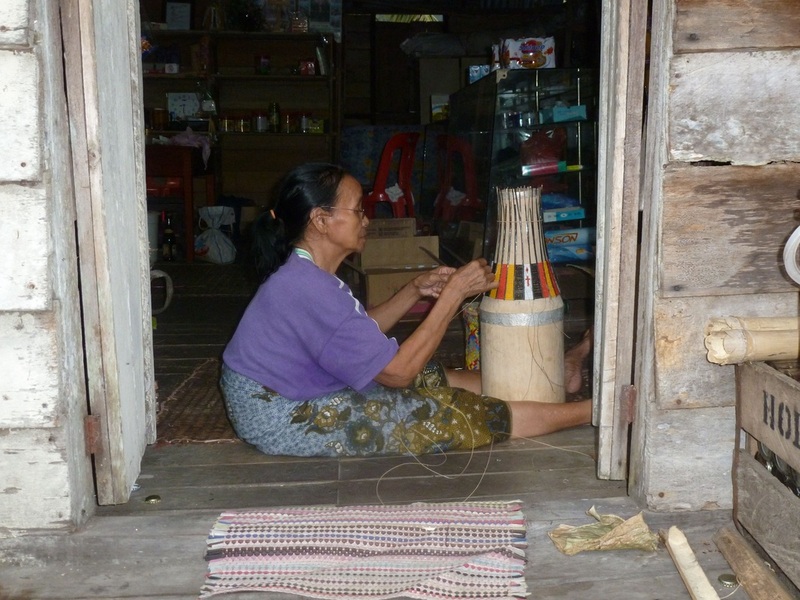 The Dyaks are the indigenous people of Borneo, renown in the past as fierce head hunters. 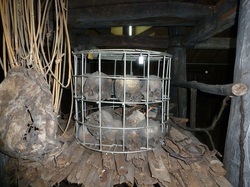 While the tribe we stayed with did have its share of souvenir heads tucked away in a storehouse, we were assured they were from long, long time ago and these days no one would never think of treating a guest like that. The longhouses I’d stayed in Kalimantan 20 years ago were not romantic get aways, they were generally decrepit wooden places with giant holes in the walls and ceilings. Since there was no furniture you slept on the bare floor, on a mat if you were lucky and forget the whole idea of a pillow. You certainly didn’t see folks in traditional dress performing welcome dances. Residents left before dawn to tend the rice fields, leaving only the most aged and betel stained to deal with visitors. To eat? Rice and very, very bony fish. It was an experience only for the very young and those impervious to roosters. Neither of which I am anymore. 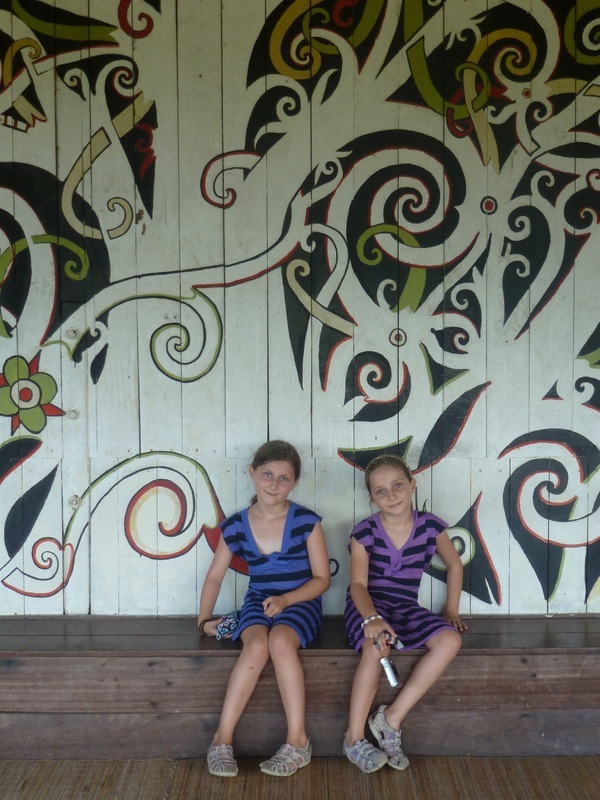 But when we got to Kuching we went to see the Sarawak cultural village where they exhibit seven different types of dwellings including Long Houses, Tall houses (same concept of families living together, just going up not out), Chinese and Malay houses. All the buildings were so gorgeous, so interesting and so appealing that I thought maybe I had been to really poor, really grotty longhouses by mistake and had missed the true architectural wonders out there. 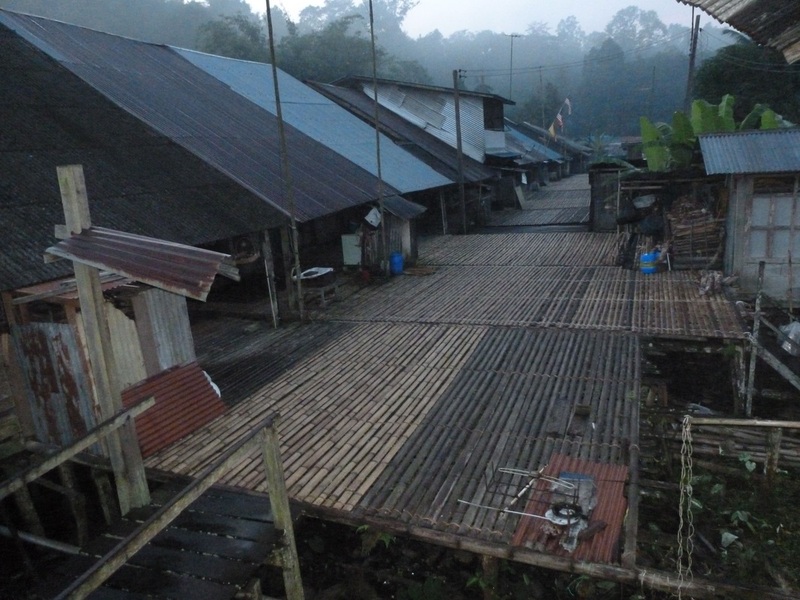 We wanted to have one more lash at the jungle before hitting the urban metropolises of Singapore and China so I started looking up longhouse visits. I couldn’t tell from the guidebooks if the closest one to Kuching was like my memories (you live with an authentic family!) or like the cultural village presentation (it’s practically a resort!) but was finally persuaded by the promise of more jungle trekking to waterfalls and cooking chicken in bamboo pipes over fires. 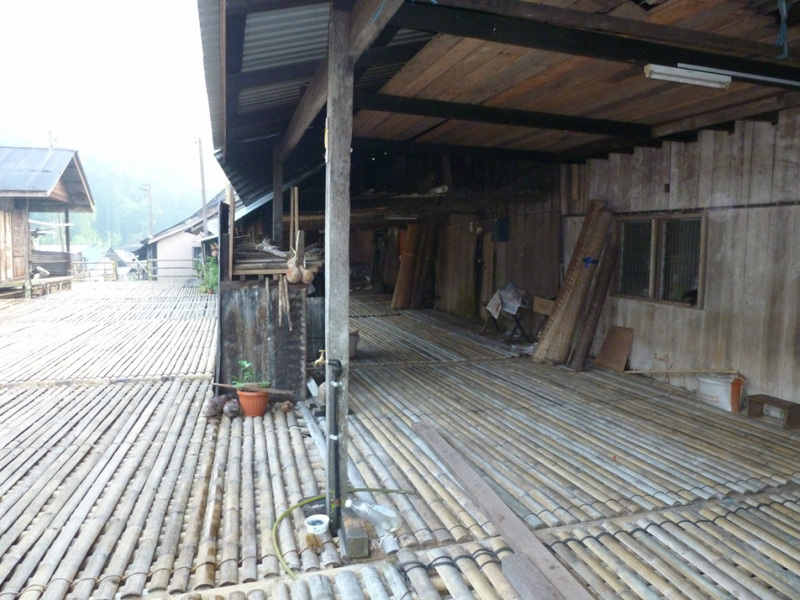 When we arrived at the Annah Rais Longhouse, I was confused. This place was like a longhouse had exploded leaving behind a maze of wooden streets twisting between a mishmash of cobbled together structures. 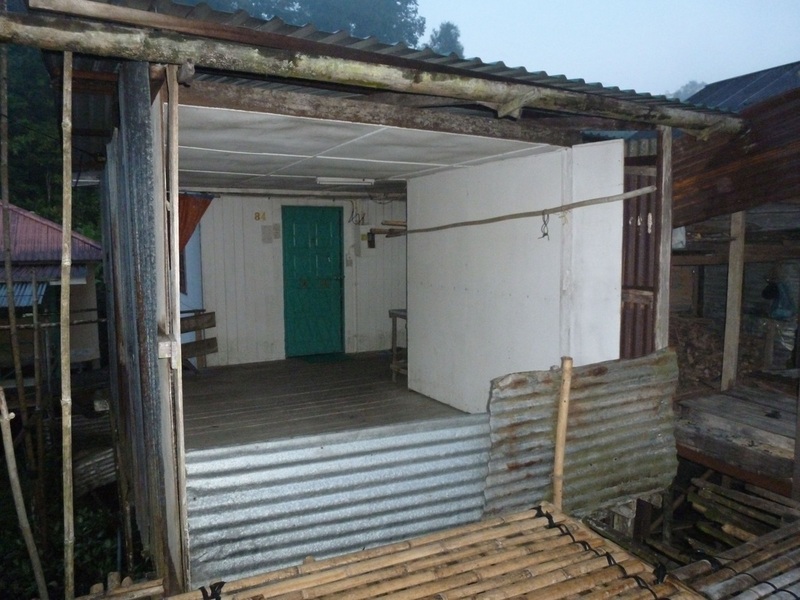 Nothing like the simple, self contained dwelling I had stayed in while visiting the Iban Dayaks of Indonesia. 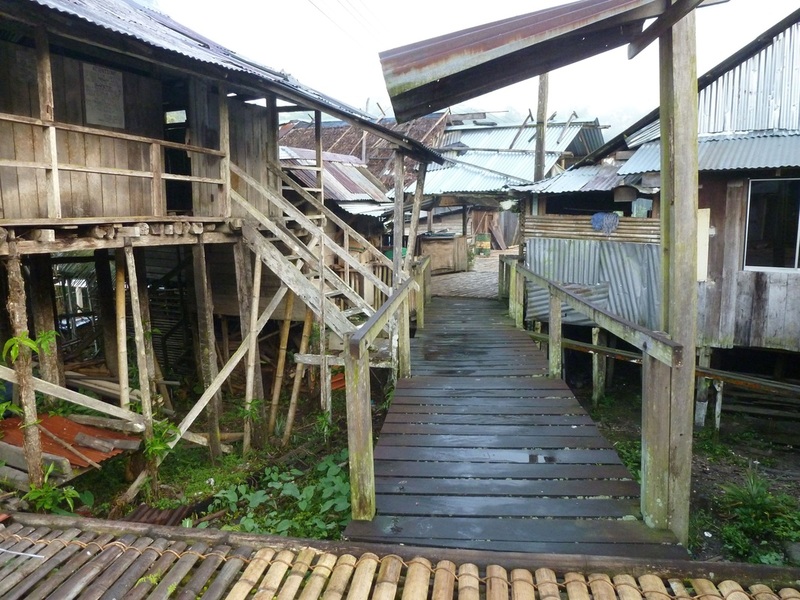 There a mere handful of families live together in a single long wooden house on stilts. I soon discovered that the Dayaks on the Malaysian side were farmers and much more peaceful than the fierce sea pirates of the Indonesian side. Many more families banded together while tilling the fields and their stilt houses grew into a village in the air. They are rambling, ramshackle wandering structures, added onto as kids marry and start their own families. The long bamboo veranda connecting buildings is so noisy it works as a very effective alarm system. Since this village has been here for literally hundreds of years, the long houses have grown to encompass four main sections and various added on bits and pieces like the rather modern seeming two bedroom apartment we were staying in. The owners live full time in Kuching and rent it out. This is apparently pretty standard - the village is technically about a thousand people, but most of the younger folk have moved to the city to work and only come home on the weekends or at festivals. This was our entrance. So, for the record, this place looks nothing like the longhouses of the Iban which most people are probably more familiar with - a single entity tucked away in the forest. Here, rooms, meeting places and storehouses are so higgly piggly so it is perfectly possible to get lost following ladders and connecting bridges, The roofs are made of zinc because they need replacing less often than palm leaves, underwear is hanging everywhere to dry and cats constantly zigzag between your feet. Which is as authentic as it gets. Thankfully we are living a less “pure” Dayak experience since there are now real beds, even sofas in the family room. It is not as uncomfortable as my last visit and yet it is certainly not the sanitized, House & Gardens idealized version offered at the Cultural Village. A french family was also staying in another room at the long house - a dad with his two adorable little girls. 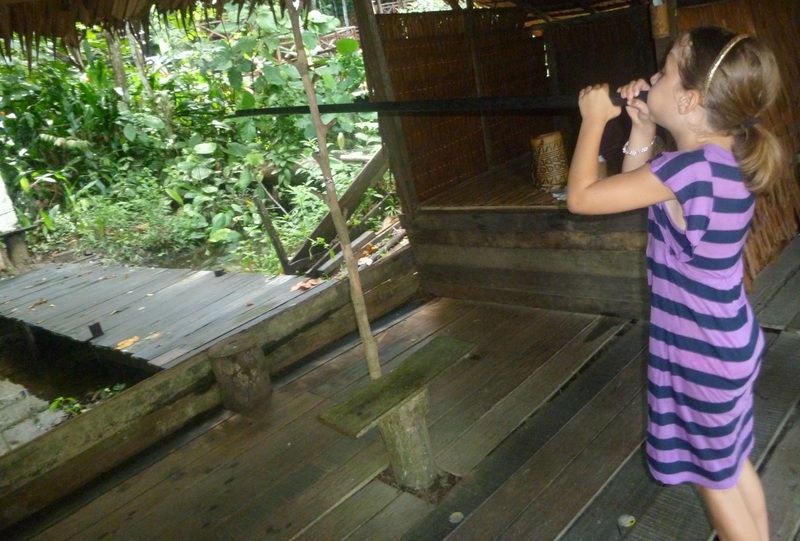 All the kids had a blast trekking in the jungle, swimming in waterfalls and snacking on fresh cut sugarcane. They also picked up some new skills like hunting with a blowpipe. The important thing is the village is still a living entity, filled with people completely ignoring you while going about their business. It is neither a museum nor a resort just a perfectly pleasant B & B in the jungle where you will be told all kinds of fascinating stuff about living there. And you will eat very well. The days of bony, charbroiled fish are over. Come here if you like the rainforest, have tolerance for cold bucket showers and want to play darts with reeeeally long tips.